Report and Resolutions of Ecological Defenders Consultative Meeting and Training held at Aluebo Town Hall, Ogale, Nchia-Eleme on the 26th of July 2016. On Wednesday the 26th of July 2016, the Health of Mother Earth Foundation (HOMEF) held a training and consultative meaeting for community environmental monitors, with specific emphasis on the planned clean-up of polluted sites in Ogoni. The meeting held at the Aluebo Town Hall, Ogale, Nchia-Eleme, Ogoni. 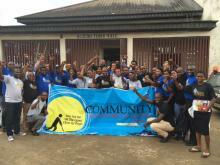 Attendance was mostly from environmental monitors who had previously been identified and trained from the four Ogoni local government areas in Rivers state, as well as civil society activists, community activists and the media.